The NDN Collective has matchED $10K to make this training happen! We are close but have not yet reached our goal. Please consider donating today! This program is a deepening of past EG work and a response to Native youth who are looking for concrete training materials and support in building environmental and cultural preservation campaigns in their communities. The intention of the training is to remain spiritually and culturally-based, including daily sweat lodges, prayer, Elders/Youth healing exchange focused on trauma and colonization, courses in Indigenous leadership development and plenty of time to explore and connect to the land. Ultimately, our mission is to see Native youth step into positions of leadership within their local communities, and nationally as land and water protectors. The primary objective of this training is to help 32 trainees/core leaders: a) tap into and re-activate the positive youth energy witnessed during Standing Rock 2016; b) create their own campaign platforms for environmental justice and cultural advocacy; c) preserve their cultural traditions and earth-based way of life, and d) after the training, initiate, establish and implement their own Earth Guardian Crews within their communities and work individually and collectively on Land and water protection campaigns. Good Medicine Training is within miles of Eureka Springs. By the mid-1700s the Kadohadacho and the Quapaw were Arkansas' only native groups of long-term residency. The Osages claimed territory within the State, but never lived there. Treaties would later give Arkansas land to 2 Eastern tribes, the Cherokee and the Choctaw, however, they never lived there. Many Tribes, in oral history, speak of the land and the healing waters of the area but never lived there. Indigenous people, from time immemorial have journeyed to places to practice Ceremony, to heal, gather, rejuvenate and we believe Good Medicine Training is one of those places. The land consists of 40 acres of mixed terrain including rivers, waterfalls, springs, caves and 10,000 sq. ft. of infrastructure, including meeting rooms, lodging, tipis and food preparation facilities. Natives lived in balance with nature for thousands of years prior to colonization. We are due for a true renaissance, a new paradigm that is centered on regenerative, earth-based living. We believe that our Indigenous youth are the ones who will help us ALL face the extreme challenges that lay ahead. We believe that youth, and even more specifically Indigenous North American youth, have many answers to the ecological crisis and crises of spirit facing us today. The vision for Good Medicine Training is just this, a place for native youth to step up to be the next generation of natural born leaders within the climate justice and cultural resilience movements. In light of this, Earth Rights (ER) has partnered with Earth Guardians (EG) to initiate our first youth oriented training for Indigenous Land and Water protectors at Good Medicine Training this coming Spring. There is a growing need for positive mentorship and community engagement by youth, for youth on Tribal homelands lands and in urban settings. By encouraging youth leadership development, as well as specific guidance on how decolonization and environmental justice are inseparable, this training is meant to bolster Indigenous youth into positions of leadership, within the movement, away from fossil fuels and towards a regenerative future. Native American youth suicide rates far surpass the statistics of many other demographics in the USA, as well as rates of addiction, abuse, and health problems. 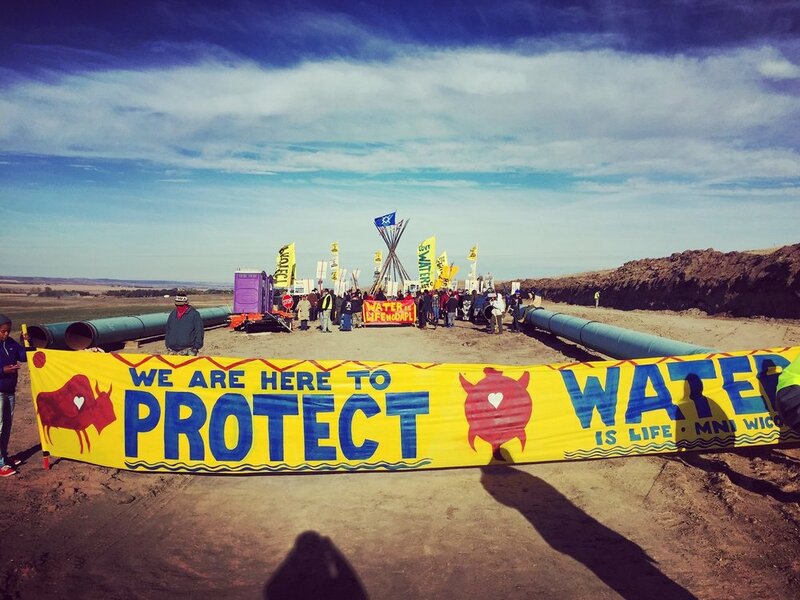 The world witnessed the success of the Standing Rock movement, initiated by Native American youth, which was centered around prayer, engagement of their community, and nonviolent direct action. We saw during Standing Rock that the youth suicide rate on Lakota Reservations dropped significantly! We believe that when young people are purpose-driven and engaged in community action, that they are provided with a new sense of meaning and hope. This training stands on the shoulders of the Standing Rock movement, and specifically IIYC, the International Indigenous Youth Council, the youth-led branch of Standing Rock that innovated and encouraged specific direct action campaigns, walks, silent strikes and more. This training is in parternship with and sponsored by Ndn Collective and Earth rights.